Federal Reserve Chairperson Jerome Powell met President Donald Trump at the White House for dinner Monday to discuss the economy’s performance and outlook, but the central bank said its chief did not share his expectations for monetary policy. 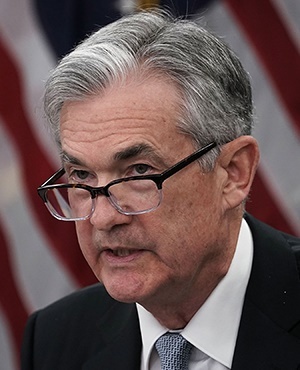 Powell’s comments were "consistent with his remarks at his press conference of last week," the Fed said in a statement. "He did not discuss his expectations for monetary policy, except to stress that the path of policy will depend entirely on incoming economic information and what that means for the outlook." The steak dinner took place the day Powell turned 66 and on the eve of his first anniversary as Fed chairman. Meetings between a president and Fed chief are rare but not unprecedented. This one, though, followed repeated public criticism by Trump of Powell over Fed rate increases that culminated with Bloomberg News reporting December 21 that Trump had discussed firing the man he picked to lead the central bank. That direct threat to Fed independence - an article of faith among investors in US assets, contributed to already steep stock-market losses that turned the month into the worst for US equities since the Great Depression. Fed Vice Chairperson Richard Clarida and Treasury Secretary Steven Mnuchin also attended the gathering, which took place in the White House residence. Mnuchin extended Trump’s invitation and the date was set on Friday, the Fed said. The meal lasted 1-1/2 hours, according to a person familiar with the matter. Powell told the president that monetary policy was aimed at supporting the Fed’s mandate of maximum employment and stable prices and that decisions were "based solely on careful, objective and non-political analysis," according to the Fed. White House spokeswoman Lindsay Walters referred all questions about the meeting to the Fed. The idea of a meeting between Powell and Trump had been publicly raised several weeks ago by White House economic adviser Larry Kudlow, who said on January 4 that both men would benefit from a "frank and candid" exchange of views. The dinner follows several months of almost unprecedented criticism by the president of the man he selected to run the Fed, breaking a decades-long tradition of the White House avoiding public comment on monetary policy out of respect for central bank independence. Trump showed no such qualms. Beginning in July, he publicly complained that Powell and his colleagues were raising rates too quickly and threatening the US economic expansion. That ire peaked following the Fed’s December 19 decision to raise rates for the fourth time in 2018. Minutes from the December meeting revealed that officials were indeed aware of downside risks, and at their January meeting they backed off their forward guidance which had called for "further gradual increases." Instead, they said the policy committee will "be patient as it determines what future adjustments to the target range" were needed, a signal that rates could go higher or lower if necessary. They left rates on hold and adopted a more flexible approach to balance sheet runoff, which they left unchanged for now.